Sugar cookies one of the things I make so often, I know the recipe by heart. 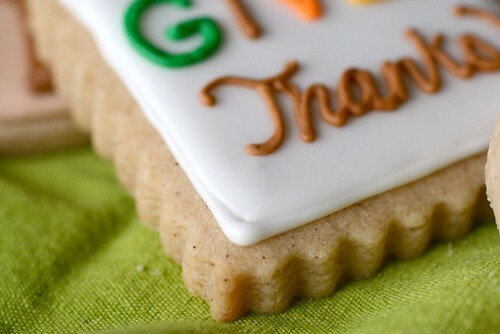 I love my favorite sugar cookie recipe so much that I find it difficult to even try new variations. This weekend since I was working on Thanksgiving favors, I decided to try a fall-inspired variety that includes brown sugar and fall spices. I am pleased to say, these taste absolutely wonderful. They are a really nice seasonal change and this recipe is a keeper. I was feeling pretty skeptical when mixing and rolling out the dough, as it was slightly drier than my usual recipe. Thankfully, these cookies have a lovely texture when all is said and done and are definitely not dry. Even though there is no maple flavoring included, my first taste of these conjured up the flavor of a maple glazed doughnut. 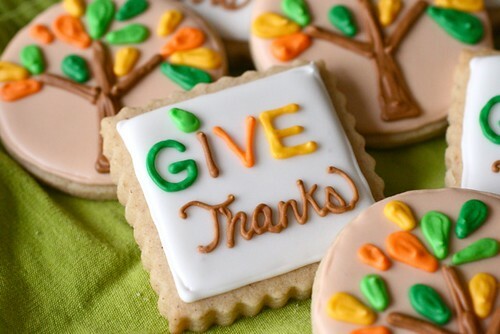 These cookie designs were inspired by the Operation: Give Thanks printables I found over at Hostess With the Mostess. (I wanted to use the printables for my Thanksgiving but they are not cooperating for me, so I am just improvising.) 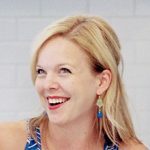 If you have never worked with royal icing before but would like to give it a try, see my royal icing tutorial for tips and tricks. Combine the flour, baking powder, salt and spices in a medium bowl; whisk to blend. In the bowl of an electric mixer, combine the sugar, brown sugar and butter. Beat on medium-high speed until light and fluffy, 2-3 minutes. Blend in the egg and vanilla. With the mixer on low speed, mix in the dry ingredients just until incorporated. Form the dough into a ball or disk and wrap tightly in plastic wrap. Chill until firm, at least 30-60 minutes. When ready to bake, preheat the oven to 350˚ F. Line baking sheets with parchment paper or silicone baking mats. On a lightly floured surface, roll the dough out to about ¼-inch thickness. 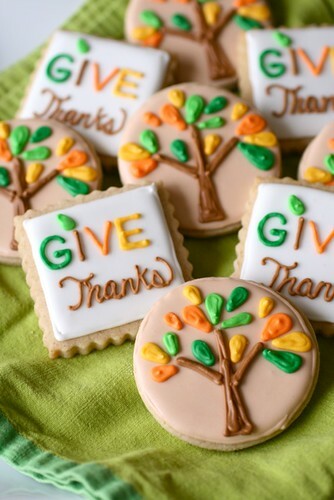 Use cookie cutters to form desired shapes and transfer to the prepared baking sheets. Bake 10-12 minutes. Let cool on the baking sheet a few minutes, then transfer to a wire rack to cool completely. Decorate as desired.